All transactions are safe and secure with a reliable history in online purchasing behind each of our associates. Buy the Spider-Man Costumes to own Spider-Man clothing and merchandise. Help your kids live out their dreams of being their favorite superhero, Spidey! These red and blue kids Spider-Man costumes feature a muscle chest and a hood with mesh eye inserts. The outfit's ease of motion will have your child climbing the walls, slinging webs, and playing for hours. This Spidey product is an official Spider-Man 3 merchandise item. The design is loosely based on Tobey Maguire's Spidey outfit from the live-action movies. 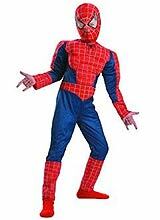 See below for the black Spider-Man costume, another popular choice. In addition to the Spider-Man Costumes above, browse the Spider-Man Clothing Gallery for more apparel like men's and women's clothes, kids shirts or hoodies.